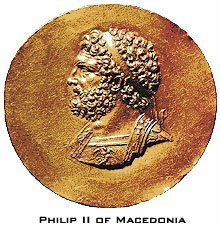 Philip 2nd of Macedonia (382-336 BC), king of Macedonia (359-336 BC), was born in Pella, the capital of ancient Macedonia. Philip 2nd was educated king who had good knowledge in the politics. Long before Philip was born, the ancient Macedonians regarded the ancient Greeks as potentially dangerous neighbors, not as kind people. The Greeks stereotyped the Macedonians as "barbarians" and treated them in the same bigoted manner in which they treated all non-Greeks. Herodotus, the Father of History, relates how the Macedonian king Alexander 1st (498-454 BC), a Philhellene (that is "a friend of the Greeks" and logically a non-Greek), wanted to take a part in the Olympic games. The Greek athletes protested, saying they would not run with a barbarian. Historian Thucydidius also considered the Macedonians as barbarians. Philip 2nd, the Macedonian "barbarian" was a hostage in Thebes, from 367 to 365, then the greatest power in Greece. During that period he observed the military techniques of Thebes, which will help him later reorganize the Macedonian army on the model of the Theban phalange. In 364 Philip returned to Macedonia and in 359 he was made regent for his infant nephew Amyntas. "Here is the man who was making ready to cross from Europe to Asia, and who cannot even cross from one table to another without losing his balance." 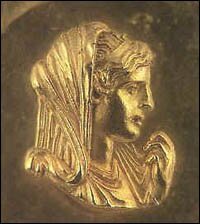 "Olympias - mother of Alexander"
"Philip 2nd cannot be a friend of the Greeks. Not only Philip is no Greek, not even related to the Greeks, but not even a barbarian from any place that can be named with honors, but a pestilent knave from Macedonia, whence it was never yet possible to buy a decent slave." The Macedonian "barbarian" defeated Greece at the battle of Chaeronea in August 338 BC and appointed himself "Commander of the Greeks". Philip's army was greatly outnumbered by the Athenian and Theban forces, yet his phalanges overwhelmed the Athenians and Thebans. His victory made him complete master of Greece. This battle had established Macedonian hegemony over Greece and this date is commonly taken as the end of Greek history and the beginning of the Macedonian era. Two years later, in the spring of 336 BC, Philip start preparing for his big invasion of Persia. He sent Attalus and Parmenion with 10,000 troops over into Asia Minor but just before he was to travel to Asia to begin the conquest, he was assassinated. His vision to conquer the Middle East, will be carried away by his son Alexander the Great. However, without the military and political efforts of Philip, Alexander would have never been as successful as he was. According to Bosworth, Philip's work with the Macedonian army and establishment of alliances with the Balkan peoples gave both himself and Alexander the resources necessary to carry out such conquests. Philip introduced the 6 meter long sarissa, a wooden pike with metal tip, for use by his infantry in the phalange. The sarissa, when held upright by the rear rows of the phalange (there were usually eight rows), helped hide maneuvers behind the phalange from the view of the enemy. When held horizontal by the front rows of the phalanx, it was a rather brutal weapon. People could be run through from 20 feet away, giving quite an advantage to the phalanx in hand-to-hand combat. Philip made the military a way of life for many Macedonian men. He made the military a professional occupation that paid well enough that the soldiers could afford to do it year-round, unlike in the past when the soldiering had only been a part-time job, something the men would do during the off peak times of farming. This allowed him to count on his man regularly, building unity and cohesion within the army. In addition to the basic phalanx, Philip and Alexander used light auxiliaries, archers, a siege train, and a cavalry.